When haymaking conditions are poor hay may be rained on or left lying in the field for prolonged time periods due to cool and humid conditions which reduced drying rates. The long drying periods with high humidity allow field growth of mold on the hay. Poor drying weather has also meant that some hay was put up wetter than usual and mold growth occurred in storage. With wet weather and high humidity, normal drying in storage may not occur and hay can retain elevated levels of moisture allowing mold growth. Mold will grow on hay without preservative added at moisture levels above 14% to 15%. The mold growth produces heat and can result in large amounts of dry matter and TDN (total digestible nutrient) loss – a loss of carbohydrates and binding of proteins. In some cases, heating can be great enough to cause spontaneous combustion and fire. Drying of stored hay (moisture loss) is enhanced by increasing ventilation, creating air spaces between bales, reducing stack size, stacking in alternating directions, and not placing tarp directly over a stack in the field as the tarp traps moisture. Since moisture tends to move up and out the top of a stack of bales, ample head space should be provided above a stack in a barn, allowing moisture to evaporate. 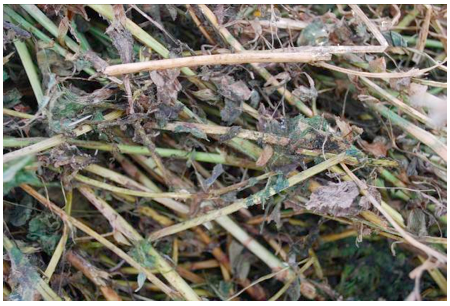 Molds commonly found in hay include Alternaria, Aspergillus, Cladosporum, Fusarium, Mucor, Penicillium, and Rhizopus. These molds can produce spores that cause respiratory problems, especially in horses and, under some conditions, will produce mycotoxins. 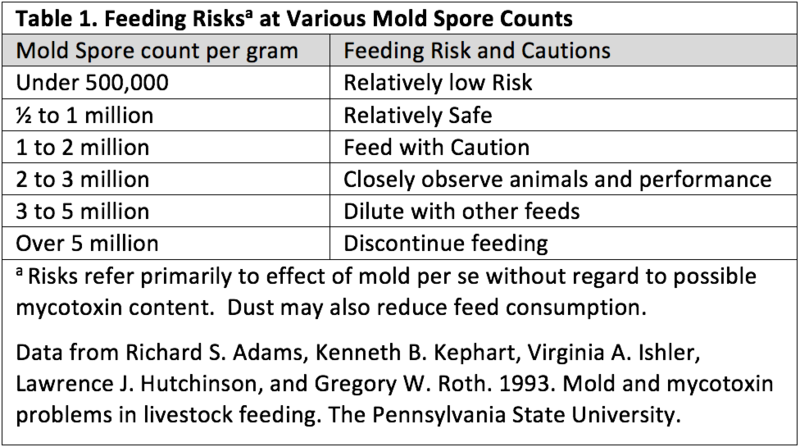 Sometimes mold spores are counted on moldy feeds to obtain an indication of the extent of molding and relative risks in feeding them. Table 1 contains classification of risks at various mold spore counts. While most molds do not produce mycotoxins, the presence of mold indicates the possibility of mycotoxin presence and animals being fed moldy hay should be watched carefully for mycotoxin symptoms. If you have mold in hay, watch for the symptoms mentioned above. If hay is dusty, take care in feeding to sensitive animals and those, especially, in areas with poor ventilation. If hay is moldy, the recommendation is to not feed it to horses at all. If symptoms of mycotoxin poisoning are observed (which can occur from mold not visible), check with a nutritionist to make sure the ration is properly balanced and with a veterinarian to eliminate other disease/health problems. Quick test kits (ELISA kits) are available to determine presence of a limited number mycotoxins but they can give false positives. Some forage testing laboratories will provide other mycotoxin tests. Often, the best strategy is to remove a suspected mycotoxin-contaminated feedstuff from the diet and see if symptoms disappear. If mycotoxins are present, the feedstuff can often be fed at a diluted rate and/or with approved feed additives. ¹Written by Dan Undersander, Univ. of Wisconsin (djunders@wisc.edu); Marvin Hall, The Pennsylvania State Univ. (mhh2@psu.edu); Richard Leep, Michigan State Univ. (leep@msu.edu); Krishona Martinson, Univ. of Minnesota (krishona@umn.edu); J. Liv. Sandberg, Univ. of Wisconsin (sandberg@ansci.wisc.edu); Glenn Shewmaker, Univ. of Idaho (gshew@uidaho.edu); Don Westerhaus, Kemin AgriFoods North America (Don.Westerhaus@kemin.com), and Lon Whitlow, North Carolina State Univ. (lon_whitlow@ncsu.edu).